Clueless When It Comes To Your Style? Was it an easy choice or is there a discard pile on your floor? 1. I don’t know my body type and consequently have no clue how to dress it. 2. My closet is a black hole and I have no clue what is in there. 3. I would be clueless if asked to define my authentic style. 4. I have no clue what colors work for me – is black a color? 5. I am clueless what an essential is – is my grass skirt an essential? 6. Accessories? Give me a clue; am I supposed to actually buy accessories –or can I wear the lei that goes with my grass skirt? Okay Clueless, let’s get to work! Six struggles – six solutions! Leave the store hangers at the store! They are bulky junk and are not part of the price of the item. Invest in my favorite – black skinny soft grip hangers. Purge – easily spelled, easily done. If it is worn out, ill fitting, out of style and has not seen the light of day for 20 years, get it the heck out of your way! Set up your closet with tops on the top and bottoms on the bottom. Arrange shirts from sleeveless to long sleeve, from white to black. Arrange the bottoms by color as well. Take all your shoes out of the cardboard boxes – again the box was not part of the price! 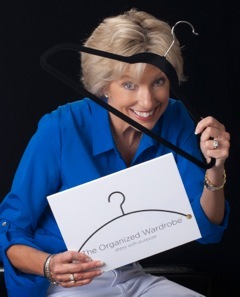 You need to see your clothing, shoes, scarves & jewelry immediately for inspiration. Your closet should be shop-able, always! 4. Is black a color? Well yes and no, but seriously there are better options for your skin tone. Color analysis can be helpful but it certainly is not without fault as there are exceptions to every rule. So if a color catches your eye, try it! On the other hand, follow this simple guideline to ascertain the color palette that suits your skin tone best. Skin tones are categorized by the seasons –spring, summer, autumn and winter. The season you belong to is in turn determined by the tone and contrast of your skin. If you have a “warm” tone, your skin has deeper undertones of gold and yellow with visible veins appearing green-ish. A “cool” tone means your skin is pale or dark with pink or blue undertones and the veins will normally look blue-ish. Then determine whether your contrast is high or low (the difference between your skin tone and your hair color). Warm & high = spring. Warm & low = autumn. Cool & high = winter. Cool & low = summer. Totally confused yet? Let’s chat further about what colors you should wear and what colors to avoid. Schedule your free 30-minute consult here. www.DoreenDove.cpm/freeconsult. Knowing which colors to wear will help you on your way to a classic and timeless wardrobe, but never be afraid to show your personal style and break the rules from time to time. 5. Is my grass skirt an essential? Pretty sure only on Maui could we consider that an essential wardrobe piece. If you were to bake a cake, you need essential ingredients. If you are creating a wardrobe, you will need essential ingredients, otherwise you end up with a lot of everything that matches nothing! The basics are a few key pieces in each category: blouses, blazers, skirts, pants, dresses, jeans, sweaters, shoes, accessories and outerwear. Here’s a quick list of wardrobe essentials. 6. Am I supposed to actually buy accessories? If your jewelry box is filled with a collection of peace signs and beaded kid treasures then yes – you need to shop for accessories. The list could include a fashion ring, a silver or gold cuff bracelet, a selection of necklaces – short, long, chunky, delicate, mixed metals and colored stones. Jewels can be bought at all price points and your collection will build over time. Go for classic but infuse some trendy pieces when they are on sale. The key is to start noticing, just as I said at the beginning. Start noticing jewelry on others, on mannequins, in your promotional emails and style magazines. Before you know it you will be bumping up your accessory drawer at all price points like it was your business and your “authentic style” will thank you! Doreen teaches women how to use style as a tool to take strategic control of their image and fully engage in their future potential. Great article. I can use the help!